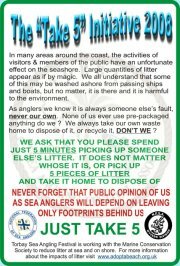 30 Anglers take part in beach clean up. The NFSA Wyvern Division has just held a clean up at Berry Head and some 15 bags of mixed rubbish was picked up by some 30 sea anglers on Sunday morning. 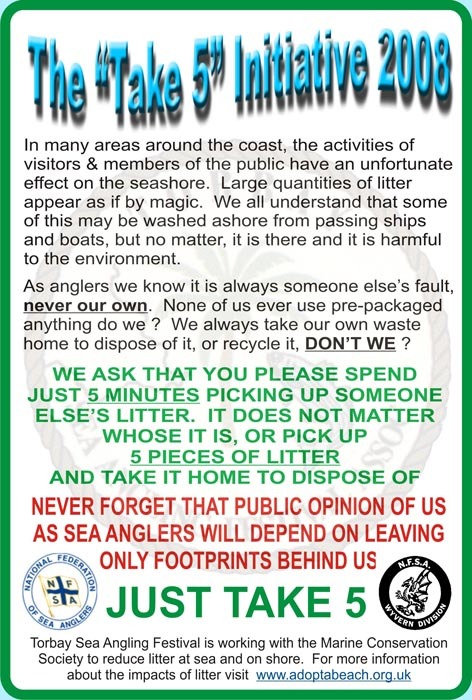 The area is normally bad for rubbish just lately, but at last the message seems to be getting through to beach users and sea anglers that use the venue, we must clean up our act and keep all venues as clean as possible. The Wyvern Division has launched the 'Take Five' campaign earlier this year. Could it be that its working already with anglers at last taking note ?. There was also a friendly fishing competition held after the clean up against the NFSA Severn Division. The points were tight for this event with the Wyvern running out in front some 35 % in front of the Severn Division. Best fish of the day was a Garfish of 1-6-0 for Wyvern Chairman Alex Parker. We should never eat a fish that has never had the chance to breed. With widespread and still growing public concern about over-fishing, and the terrible waste from fishery discards, most people would be horrified to realise that some fishermen are targeting the wild bass stocks before they have ever had a chance to spawn. Despite the fact that such small fish are readily and cheaply available on the fish counter as farmed bass. "Wild baby bass are just too valuable a resource to be wasted like this" said John Leballeur, Chairman of the Bass Anglers Sportfishing Society's Restoration Team. If these baby fish were allowed to grow for just a little longer, every wild bass now served up at merely plate-size would have the opportunity to grow and spawn, and to be served as fillets providing two or more good meals instead of just the one, reducing the need to kill so many wild fish to fill our plates. "We really need to start taking the conservation of our marine resources seriously, rather than simply talking about doing so", he added. "And consumers can make a real difference by being more selective about what they buy and what they order when they dine out." Responding to claims that increasing the legal size that bass may be taken would only lead to more discards, John Leballeur points out that young bass congregate in shallow inshore waters. And that by allowing their exploitation at such a small size trawlers are encouraged to fish where small fish are gathered. That only leads to already unacceptable discards of fish smaller than even the current legal size. Around 65% of what should be the future stock is being destroyed by trawling in the Eastern Channel, and yet it was to defend this fishery that the Minister rejected all previous advice to increase the Minimum Landing size of bass. And for every baby bass served on a plate, many other smaller fish will have died simply to be dumped back dead. The ethical course of action, when demand for small fish can readily be met from fish farms, is to preserve our precious stocks of wild bass, by only taking fewer, larger, more valuable fish from the stock, and by avoiding fishing where the future stocks are growing. "The Government backed down on its plans to increase the Minimum Landing Size for bass. They must now urgently deliver on their promises to protect these small fish by closing the areas where they gather to feed and grow, and introduce measures to protect the areas where breeding fish congregate, as well as introducing a close season leaving them to gather to breed in peace"
"Successive governments have ignored warnings from fisheries scientists about the measures needed to restore fish-stocks, preferring to bow down and placate short-term commercial fishing interests with the predictable results now apparent for all to see". Recent scientific evidence has raised concerns about collapsing recruitment levels in the UK bass fishery, the time to act is now. Bass are a slow growing and late maturing species, capable of growing to over 20lbs, living some 25 years and capable of spawning up to 15 times. The current Minimum Landing Size (MLS) is just 36cm (around 1 lb). An MLS of 45cm (around 2lb) would ensure that all females will have spawned at least once before being taken. It is the larger fish which are greatly prized by anglers, but which have become increasingly scarce in recent years. DEFRA announced today that 60 miles of Lyme Bay will be closed to all bottom trawling and scallop-dredging to protect features important to the area's marine ecology. Ministers today banned damaging types of fishing in 60 square nautical miles of sea off the South West coast to protect threatened sea life. About ten per cent of Lyme Bay from West Bay to Beer Head will be permanently closed to scallop dredgers and bottom trawlers which drag nets along the seabed, to safeguard the area's rich marine life and habitats. Lyme Bay is home to world-renowned reefs as well as important species including pink sea fans, sunset cup corals and several rare sponges. After public consultation and a full assessment of the impacts, the government has ordered that the area be closed from early July. Fishing using nets nearer the surface or static nets and lines will still be allowed, as will diving for scallops, scuba diving and sea angling.